Trichomonas vaginalis is a parasite from the human urogenital tract that causes trichomonosis, the most prevalent non-viral sexually transmitted disease. The neutrophil infiltration has been considered to be primarily responsible for cytological changes observed at infection site, and the chemoattractants can play an important role in this leukocytic recruitment. Nitric oxide (NO) is one of the most widespread mediator compounds, and it is implicated in modulation of immunological mechanisms. Extracellular nucleotides and nucleosides are signaling molecules involved in several processes, including immune responses and control of leukocyte trafficking. Ectonucleoside triphosphate diphosphohydrolase members, ecto-5′-nucleotidase, and adenosine deaminase (ectoADA) have been characterized in T. vaginalis. Herein, we investigated the effects of purinergic system on NO production by neutrophils stimulated with T. vaginalis. The trophozoites were able to induce a high NO synthesis by neutrophils through iNOS pathway. The extracellular nucleotides ATP, ADP, and ATPγS (a non-hydrolyzable ATP analog) showed no significant change in NO secretion. In contrast, adenosine and its degradation product, inosine, promoted a low production of the compound. The immunosuppressive effect of adenosine upon NO release by neutrophils occurred due to adenosine A2A receptor activation. The ecto-5′-nucleotidase activity displayed by T. vaginalis was shown to be important in adenosine generation, indicating the efficiency of purinergic cascade. 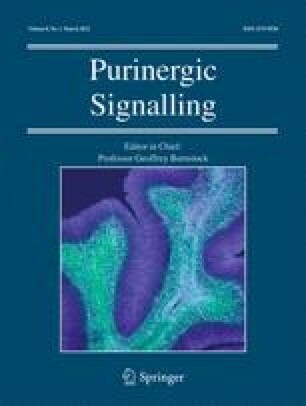 Our data suggest the influence of purinergic signaling, specifically adenosinergic system, on NO production by neutrophils in T. vaginalis infection, contributing to the immunological aspects of disease. A.P.F. is recipient of fellowship from CNPq. This study received financial support from the Conselho Nacional de Desenvolvimento Científico e Tecnológico (CNPq, Brazil) grant #477348/2008-4 awarded to T.T., and from the NANOBIOTEC-Brazil program from CAPES (Brazil). The authors thank Dr. Christina Bittar and Hospital de Clínicas de Porto Alegre for neutrophil phenotypic analysis.